We're almost ready to pull the engine. Actually we are ready, but we don't have anything to pull it with yet. Maybe next week. That's when things will really start happening. We'll have some really exciting things to write about then. Unlike now. Right now we're cutting up sheet metal, making panels for the transmission tunnel, a rather tedious job. We're going to need six of these panels altogether, three per side, all made from lightweight 20 gauge steel, except for the two panels at the rear, which need to be 16 gauge steel because their main job is to restrain the driveshaft when it breaks apart and flails around inside the tunnel. The other panels are appearance items only, although they do help to keep hands, fingers, and other objects out of the spinning driveshaft, never a bad idea. We've gone just about as far as we can on the exhaust without a muffler. They keep pushing the shipping date back. We're not going to let that slow us down, though. 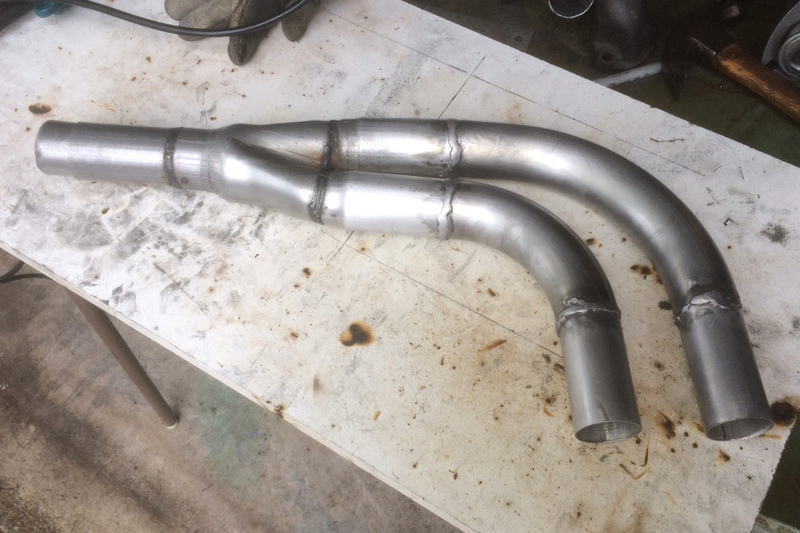 We've assembled the front of the exhaust, and we don't need to weld it together right now. The only chassis welding we need to do is on the exhaust hanger brackets, and we don't need the engine in the car for that. 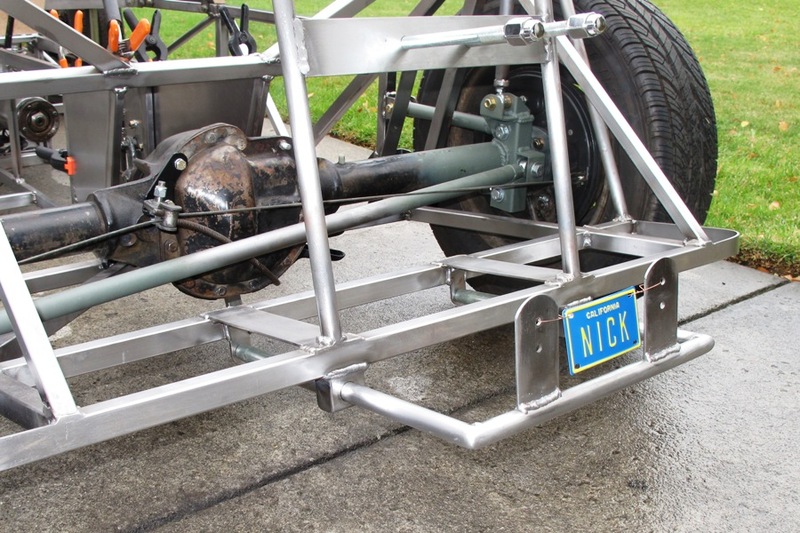 Once we get the muffler, we can mount the bracket 2-7/8" above the bottom frame rail, on center, and we'll then be able to run a pipe between the muffler and the Y-connector anytime we want, once we have a muffler. It turns out we're still making brackets. I know we said we were all done with that, but they just keep popping up. The latest were for the horns. The MGB has two horns, one on either side of the car. They each have a different tone, so I think they're both needed. We completely forgot about them because we never actually use the horn, but you never know when you might need to call attention to yourself. So we'll go ahead and install them, even though there isn't a lot of room left in the front of the car. They seem to fit between the upper A-arm pickups. Barely. We also needed a bracket for the ignition coil. 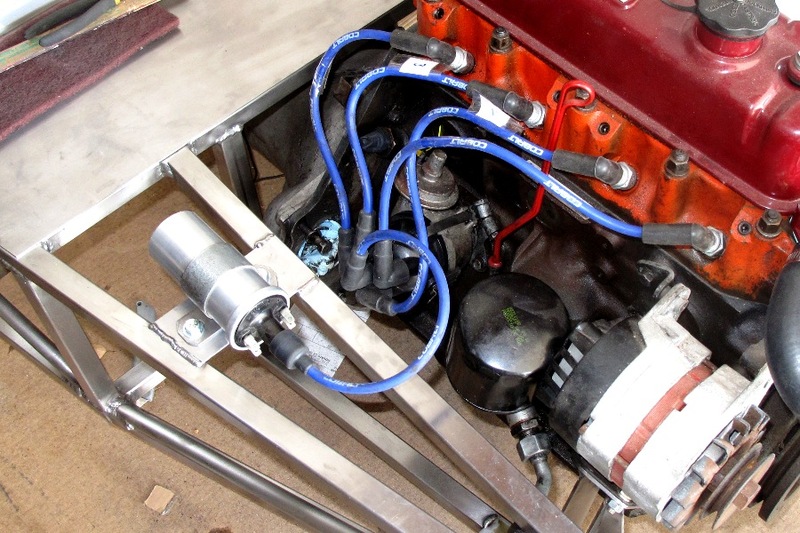 Most people mount the coil on the rear engine bay shelf, but that's not where it goes. 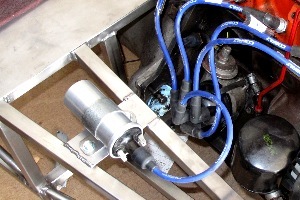 It goes alongside the engine, close to the distributor, and also close to where the ignition wires come out of the wiring harness. 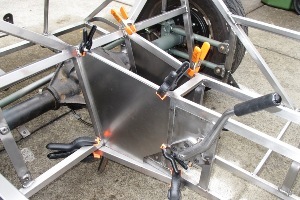 The Locost has the perfect spot for the coil between the F and R frame rails. 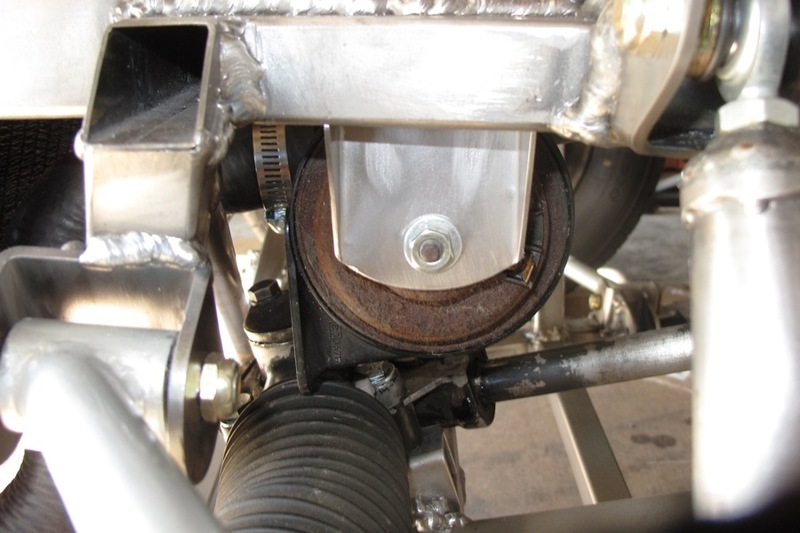 The only issue we had, if there is one, is that we made both the horn and coil mounting brackets out of 16 gauge sheet metal, instead of our standard 1/8" bar stock. Which has us a little concerned, although I think we'll be okay. We had to make a few changes to a couple of other parts. The first was the spare tire carrier. It was too long. We made it adjustable for tire width, but like most of our adjustable designs, we placed the range of adjustment just outside of the actual distance we needed. Fortunately, it's much easier to shorten things than to lengthen them. Very often you can just cut off the excess. That's what we did here, although we also had to weld in a new rear bar to take the place of the one we cut off. 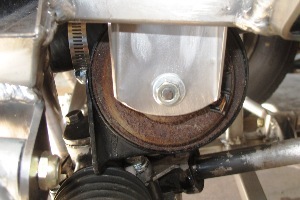 You might be thinking, rather than shorten the carrier by cutting off the rear bar, it may have been easier to cut off the open ends at the front. And you'd be right about that of course, but easier isn't always our first priority. The open ends have threaded sleeves welded in, which cost about five bucks each. The new rear bar came from our spare metal bin, and therefore cost nothing. 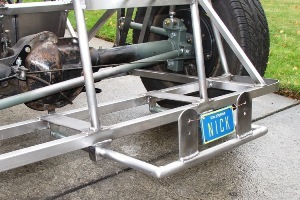 We also welded on mounting brackets for the license plate holder, which means the carrier is done and we can therefore never make any more changes to it. The other thing we had to change was the handbrake cable. We originally cut it too short. This was somewhat less fortunate than our too-long spare tire carrier, because lengthening a cable is difficult. Rather than do that, we found another one on eBay, $25 or best offer, and they took $20. Suckers. (Not really, we love eBay). We'll have to shorten the new cable as well, but this time we'll leave enough slack so we can run it behind and to the side of the differential, and not below it where the cable is now, free to intercept rocks and dirt and all other types of road debris. The saga of the Harbor Freight angle grinder continues. The fan finally bit the dust, so the grinder starts up nice and quiet now. The downside is that after about 2 minutes of grinding, it gets a little too hot to handle. So I think in retrospect we were better off with the fan engaged, despite the noise, and it's unlikely the grinder will survive much longer. Although with winter coming it'll run cooler, so maybe. In any case that angle grinder had to be the best twenty bucks we ever spent. It got us through a ton of cutting and grinding, and was good for some entertaining stories along the way. And it's not dead yet.